Topic: Bridges should modify the ground. It would be nice that bridges automatically modify the ground .. similar to that as they do currently the tunnels. Re: Bridges should modify the ground. You mean terraforming the opposite side if possible? Those details that make the game more practical. Support very much so. Having a hard time placing bridges with 1/2 height tiles in pak128. Imagine the learning curve would be getting worse for first time players, unable to figure out why they can't place certain bridges in places. This can probaby also need to add islands as the bridge progresses if the max bridge lenght is too much. I'll get it a look. Such things happening automatically can have catastrophic effects on the bank balance. Bridge tools since RC120 look buged, sometimes I can't even start a bridge from existing way ends (I have to destroy them, build the bridge from nothing, then eventually connect the bridge to the remaining pieces of way). This whould be really easy to solve if we were able to use confirmation boxes on the UI, something prissi is against. Someone has a better idea? Like, you are going to implant a 12-tile-long bridge, so 12 ground tiles will be highlighted from the tile which the cursor is hovering. The suitable tiles are highlighted green, red if not. If one still tries to implant the bridge on an unsuitable place, the computer will stand up and slap the player's face, "you dummy!" Such confirmation stuff would be a hassle to confirm all the time, like a slap to player's face This would annihilate the practical effect of the feature. Another solution: have confirmation box that can be disabled through settings menu or an improved canceling mechanism. If achieved with the tunnels. Why not on bridges? I was just thinking of automatic islands to work around the maximum bridge length. Just terraforming the other shore will likely be less likely to cause unintended terraforming, although it can occasionally still be pretty bad. En -> I would use this technique when creating straight track sections (Ctrl) on a hilly terrain. Es -> Me gustaría usar esta técnica a la hora de crear tramos de vía rectas (Ctrl) sobre un terreno abrupto. I was just thinking of automatic islands to work around the maximum bridge length. Terraforming the opposite side of the bridge is a good idea indeed. How about also allowing bridges to be replaced simply by dragging the new bridge over them so long as the new bridge covers both start and end slopes? Well my idea was just building *one* island, showing the preview of how long the bridge will be. This is not gamebreaking as it's something the user could already do, and the preview clearly hints, it will just build one bridge up to a articial island. This will visually warn users that will look... meh, so people that really care about that, will refrain them from doing it, automatically. Will look into it, James. It's not perfect, but it's clearly better to what we have, imho. That's if not anyone has a better odea, ofc. Oh, hey, I hadn't caught that, but personally, I think that's a good idea. After all, if they really want, they can build the next section on the other side of the artificial island and go from there. Especially if it's an un-doable way build, it would be handy to get a visual idea of how long the tile limit is (because you can count, but it's easier to see). Automatically building islands might kind of negate the purpose of maximum length to begin with. I'm not sure what the exact purpose is, but I can imagine that it is because pillarless bridges can't span much. Pillared bridges can be longer, but cost more. If unpillared bridges with islands or hills are cheaper than bridges with pillars, then something is wrong in the pak set. The same can be said if pillared bridges have a maximum length. The only cases I can think of where bridges have intermediate islands or hills to break it up, is when there is a change in type of bridge, or even a switch from bridge to tunnel. Placement of these islands, or hills, are determined by other things that the maximum length of the bridges at the ends. 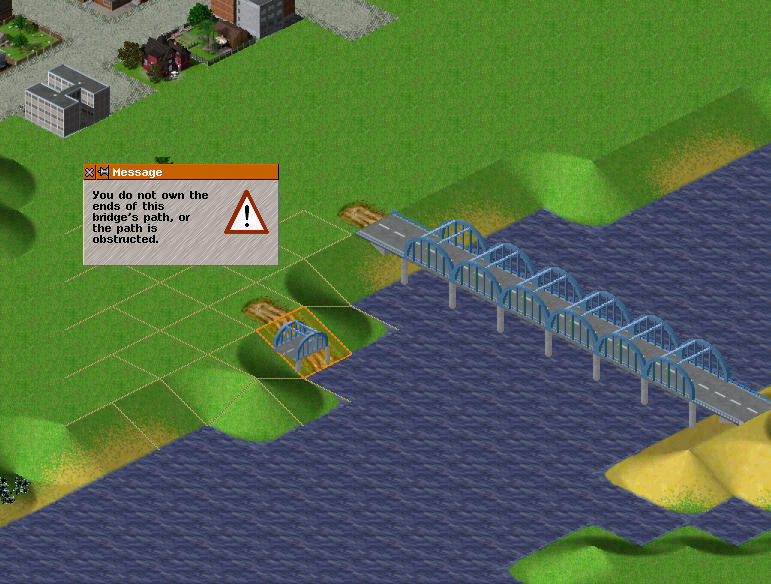 Correct, but the player already clicked one *kind* of a bridge, when this feature appears. He can click more, preview wich is longer, and make his choice no? It's just making building easier, and more visual. Another option whould be require the player to click and *DRAG* the mouse up to the other side, and building islands *as a preview*. If the user unclicks, it will be built. But this changes current behaviour, where the player just clicks once on the start, and the bridge is built, if possible. After a long time, this it seems to be lost. As with tunnels, it may be indeed wise to allow for bridges to lower a single tile. That way you probably do no go backrupt. Raising land can have any strange effect (including charging millions), but lowering rarely fails and will cost you at max one tile. In the moment I have the biggest pproblem with bridges, that the need two height levels in pak128 or so, and hence are really difficult beasts to built for instance for rails. Lowering a tile should have the same potential for expensive cascading as far as I can see. Perhaps more so, as infrastructure is mostly located at the bottom of tall slopes than at the top. Lowering a tile on a slope (as for tunnels) can have the maximum cost of 1 action. It will fail as with tunnels if there is something prevening it. The depicted lowering operation did not cost the 1000 that the tool says it should cost, but 2000. The tile in question that needs to be modified is the one to the left of the cursor. Although this is a double-height pak set, and not a half height pak, that shouldn't make a difference, should it? In a half-height pak set, one would need to lower the other corner as well to create a full height slope for a tunnel. I'm not sure how bridges fit into this, as bridges should ideally be able to start from both kinds of slopes, and need raised land to have enough clearance in half-height pak sets. There is also the the artificial slope tool, which does not have cascading effects when used, this could be used instead of the lower/raise ground tools. For tunnels it is undesirable, as one could end with a tunnel entrance with an half-open volume behind it. That isn't an issue for bridges though, they would just go nowhere, and the player could fix it with the appropriate tools. IMO, instead of auto-terraforming, bridges with two ramps tiles would be better. Bridge ramps should be priced differently from their span. This is because you can save money in the long term with artificial slopes. As such they should cost closer to normal way amounts to encourage their use over excessive terraforming. Some will argue that artificial slopes should rather have bridge like maintenance costs. However I do not think that feature is viable to implement due to the major ownership questions it raises. Lowering maintenance of bridge ramps is probably easier. Alternatively one could force ramp costs onto bridge maintenance. No matter how you connect the bridge (even a 1 tile flat bridge or 12 tile with ramps), you always pay a fixed amount for ramps for it. This will cause problems with elevated ways however, since you could still use them as cheaper bridges. Hence why free or cheap ramps is still my more recommended solution. Terraforming costs need to be altered such that it is based on surface area of artificial wall made and volume of earth moved. This would potentially make small changes cheaper while bigger, more substantial changes cost more.